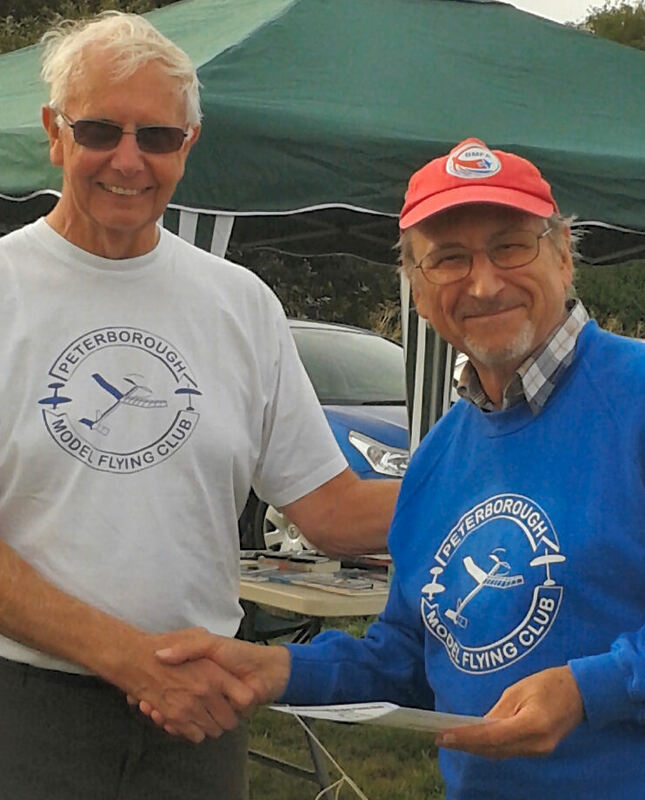 one of the nicest, most relaxed Flying meeting/competition takes place this coming Sunday at Ferry Meadows, Peterborough, UK. 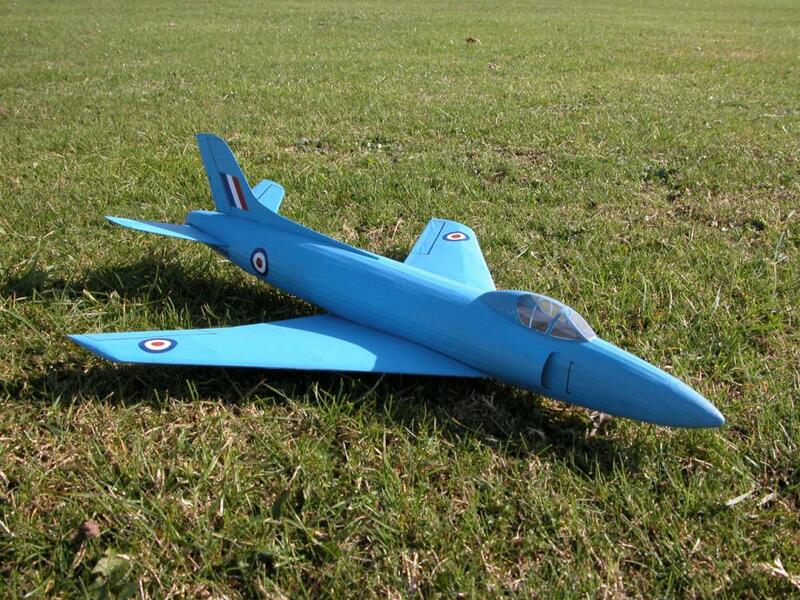 It is run by Peterborough MAC and, uniquely, has competition for Jetex/Rapier powered profile and built up scale model jets. This year there is also an 'EDF' jet class. After missing out on the action in 2014 and 2015 I hope to be competing with a couple of models - especially if the weather allows me to trim out my latest Jetex 50 powered T-38 Talon. Above: Jetex 50 powered T-38. It is 15% larger than Rapier L-2 versions. The balsa is covered with a very nice sticky-back plastic film printed for me by microaces.com. I hope it flies as well as previous versions, if not, Andy Blackwell will clean up (again!). Neil Sommerin will be there with stocks of motors (both L-1 and L-2s). I hope Mark Digby will be there with his camera. The weather at this time of the year is usually very flyable. See you there! Windy day, 15 mph all day but quite pleasant with it. Cloud cover to start but breaking to sunshine after lunch. Having pulled a muscle in my back, even test launches were painfull so it was a case of brave it out. The rocket flyers were well represented by Dr Simmonds, Howard, Chris, Andy Sephton, Mike Stuart and Derek Knight. The profile scale was represented by all the above with multiple models in some cases. Roger gave us all a good stuffing, winning both profile scale and scale for rapier/jetex. Well done Herr Doktor! Didn't care much for the fact we had to pay a parking charge but at least the full charges were reduced with a concession code for PMFC. Saw lots of smashed models throughout the day but all in all it was fun. A double booking on Sunday meant that mark and myself missed out, I blame Sky for moving our match from Saturday so they could televise it. Mark had been busy with printed paper, spray mount and glue stick creating a new profile model but the progress slowed when increased wind speeds were forecast for the weekend. Better weather and I may have given the football a miss. Looking forward to Old Warden in a couple of weeks, wonder if that's enough time for me to finish of something new? As Andy intimates, conditions, unusually for this late summer meeting at Ferry Meadows, were very blustery with a wind which gusted up to 18 knots, according to my little electronic anemometer. But the sun shone and, if you waited patiently, you could launch in the (comparative and brief) lulls between the blusteriness. 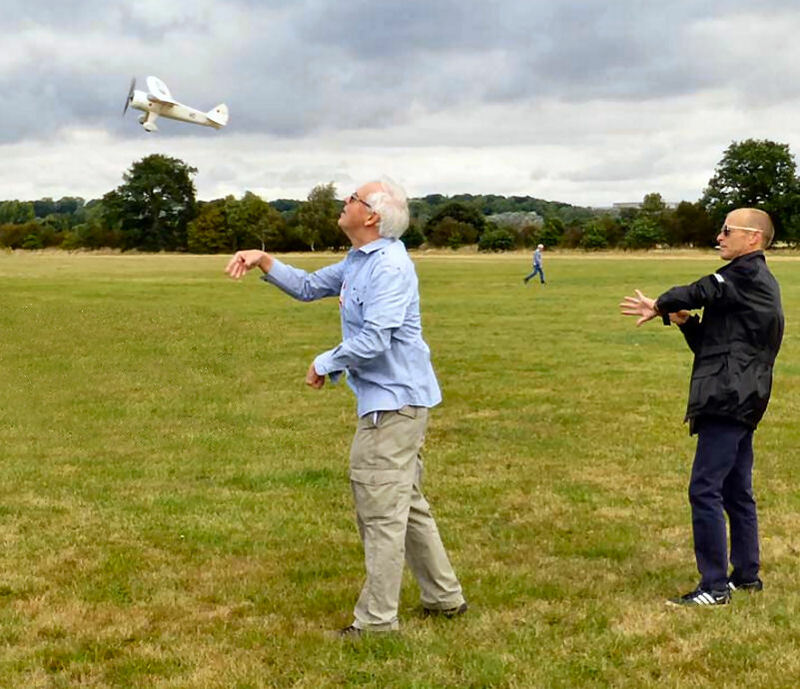 The Rocketeers had a good time, flying when many other models were on the ground. 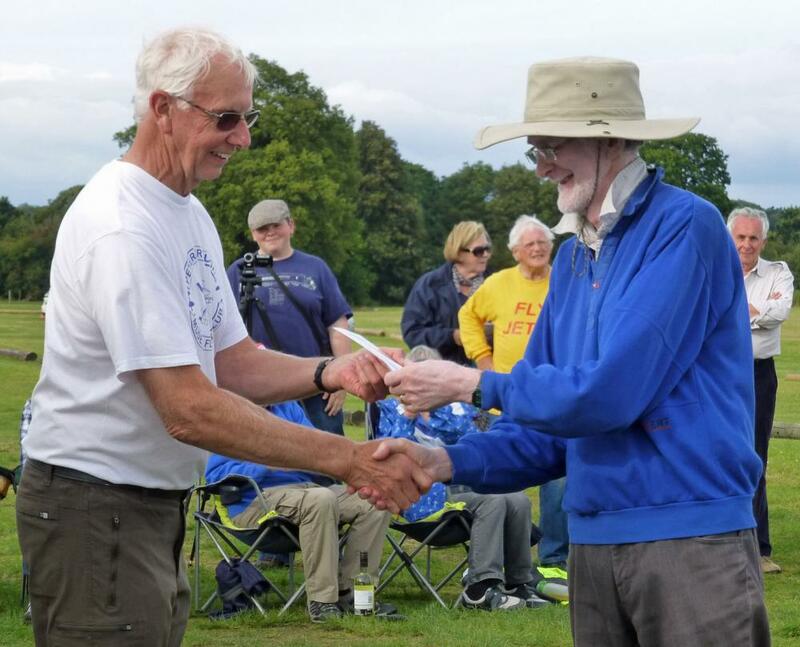 We obviously impressed Brian Waterland of the Peterborough club, who wrote: "I applaud all those who flew, particularly the scale guys - for example, all 10 entrants in Jetex/Rapier Profile flew!" There were fewer competitors in 'authentic scale', and in the conditions, the light tissue covered models tended to be blown about more, so I think only three of us managed a 'complete' flight, that is, one with a launch, climb out, cruise under power and a 'landing'. Mike Stuart had no success with his well-campaigned Fiat G-91 which had earlier topped the 'static' scores. 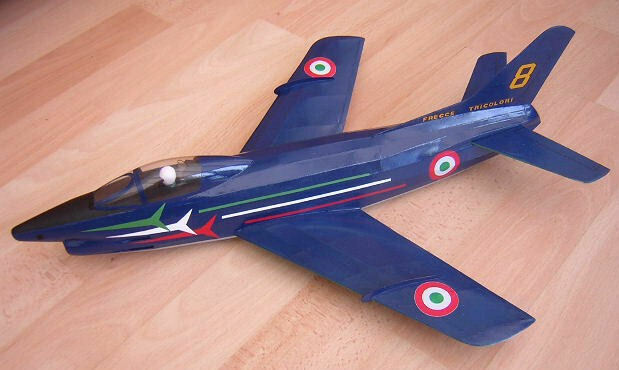 Above: Mike's tried his well campaigned Fiat G-91 with a variety of motors, but it didn't like the conditions st all. The profile models tended to carve through the choppy air low down rather better, but even so they could be 'shot down' mid cruise and either spun-in (like my Cutlass) or 'tent pegged' like Andy's rather tasty new T-38 Talon. This model, from my latest 'part kit' looked, very promising with the new '160 mN Rapier L-2 motors, but Andy could not quite trim it out in the conditions. I expect it to be a splendid flyer when (a) Andy has trimmed it out and (b) it's calmer! Above: all we need is a profile Vulcan to complete the set! 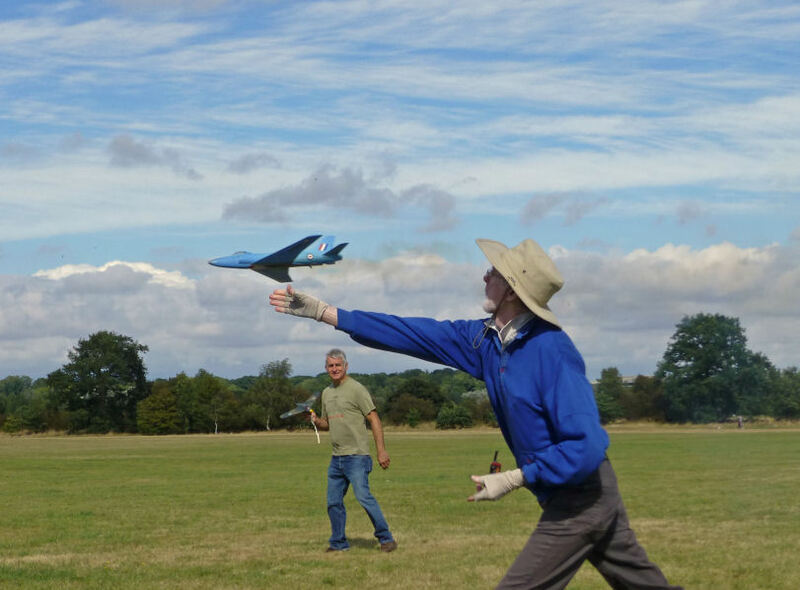 Howard's made an impressive flight after on-field repairs, but Andy Sephton's Victor came in for some hard arrivals and had one exciting 'touch and go'. Andy commented, "I The last flight of the Victor was about the best it has ever done. The flick loop after the motor has run out is also a regular characteristic! I think it has something to do with the shape of the swept wing." Other profile models included Howard's foam T-38, Chris's impressive MiG 29 and my own well-flown T-38, which didn't like the conditions at all and was 'shot down' twice whilst cruising and seemingly set for a good flight. But my well flown Skyray with an L-2HP powered through the wind and I managed a good high flight with top launch, climb-out and cruise points and reasonable landing points. Coupled with good static points this was sufficient for 'gold'. 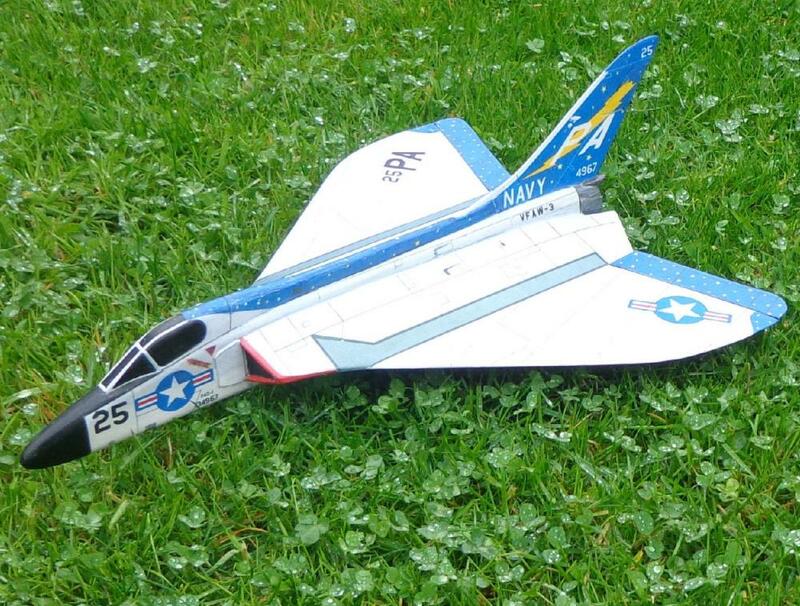 Howard, who got silver with his Valiant, will point out that though the Skyray is based on Bill Dean's design from way-back mine is basically on Howard's template! In 'authentic scale' Chris Richards' MiG 15 performed some splendid loops and was really fast (I had to duck several times) and Howard's venerable Swift made, I thought, the best flights of the day, apart from the landings! Above: Howard's Swift flew well with the new L-2 motors. I was lucky with my KK MiG 15 (another Bill Dean design), and caught some lift so that the model, after a good launch and climb-out was quite high when the motor cut out and it glided to a reasonable landing just inside the field. Being my first comp since my extended my stay in hospital I was quite pleased to 'clean up', as they say, which I haven't done since (gulp!) 2010! Above: Derek with his DH 108. Is the angle of launch too steep? Chris Richards and Andy look on. Ian Lever had better luck with his modified KK MiG 15. This appears to have a good power-to-weight ratio, and, in its winning flight, climbed away at 90 degrees to the wind, cruised around for a bit and didn't cartwheel on landing. Very impressive. 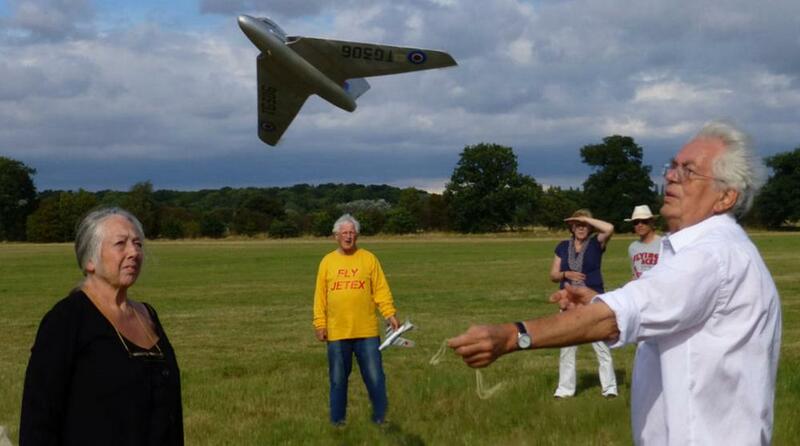 Strange that Bill Dean's 60-year old designs won three of the scale jet classes! Us jet jockeys demonstrated what Paul del Gatto said many years ago, "if you fly in a wind you will have spectacular flights, but also many smashes". 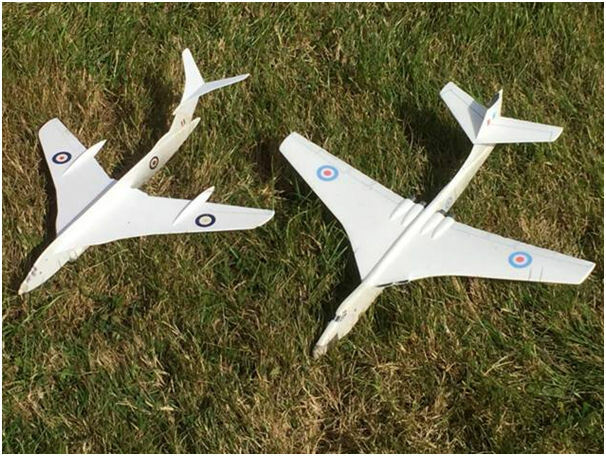 Our Rapier powered models certainly bounced better than the EDF powered examples (Ian's all-red MiG 15 was destroyed on its next flight) as the 'power train' is significantly heavier. I hope to post more photos of this event in due course. I hope to post more photos in due course. As is evident from the photos it was a nice sunny day and we had a good time. It was a pity several nice scale EDF jets stayed in their boxes. EDF jets are I think more fragile than Rapier models - the LiPo battery in particular can do a lot of damage in a hard arrival. Perhaps next year we will see more models in the 'EDF' category. 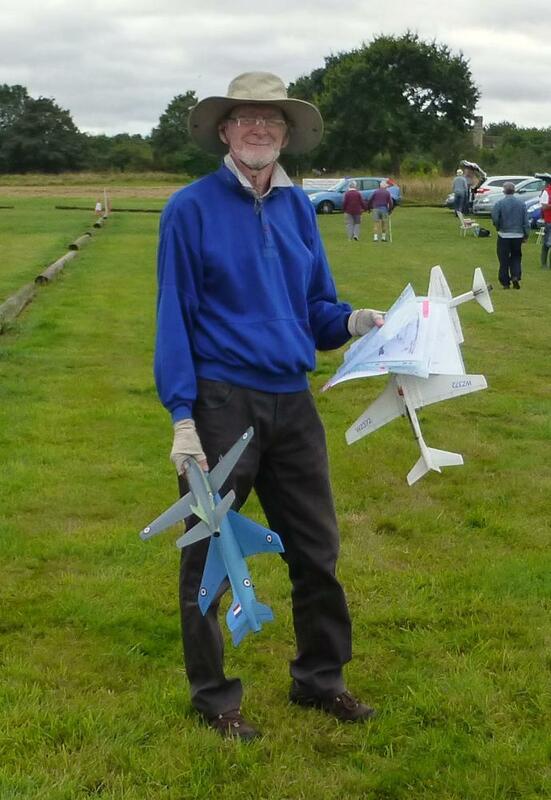 Though Mike Stewart, an ace Rapier flyer if ever there was one, missed out this year with his Fiat G-91, he did win 'Kit Scale' with his Mr Mulligan, which did look quite battered by the end of the day! Note the encouraging presence of Andy!